Tania Crosse - Devon based historical writer, Morwellham's Child, The River Girl, Cherrybrook Rose and more! "An outstanding writer of historical fiction"
a master of her craft"
The fourth in Tania's new series set in London and the south east, this latest story of trauma & redemption will move you to tears. Set once again in Banbury Street where Tania herself lived as a child, you will also meet once again some of the characters from "The Candle Factory Girl". 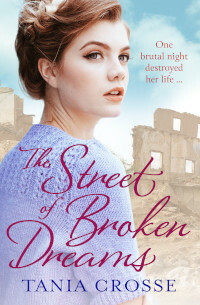 View more about "The Street of Broken Dreams"
And if you haven't done so already, why not discover Dartmoor through Tania's previous titles? A series of ten exciting and dynamic tales interpret local history in a vivid and evocative manner. With her lively style, Tania's books are packed full of poignant drama, reflecting the harsh reality of life on remote Dartmoor in the past. Her creative imagination translates fact into gripping, heart-wrenching stories that mirror the rugged and gritty landscape that inspires them. But no matter which of Tania's books you read, they will have you reading into the small hours as you become entangled in the lives of her heroes and heroines. Can she ever escape her life of brutality and betrayal? A dead child, a tragic accident, can two shattered souls find peace? What agonies will WW2 bring to Meg? Will the past return to haunt her?